Tomorrow is the last day of the VCM blog party. Thanks to Joan at Anything Goes Here for being our hostess. I'm going to end this party with some of my most fun and kitschy decorations. If only I had a time machine I would set it to take me back to November 1957 and put me right into the middle of Woolworths. I think this gem probably dates to around 1971. It has openings all around so you can look in and see Santa and his reindeer. 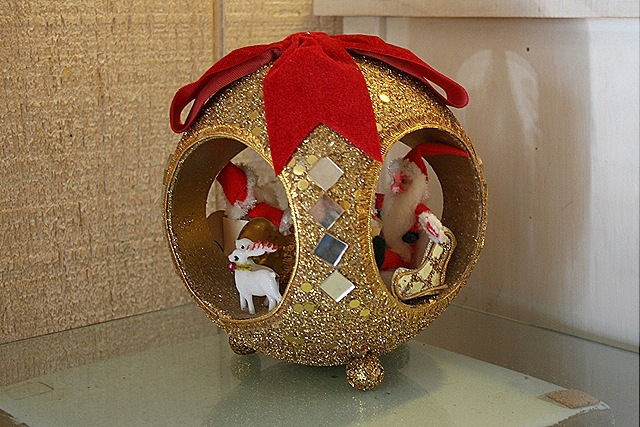 The glitter, the mirrors, the little ball feet! I have the original box which also has circle cut outs so you can appreciate the decoration in all it's 3D glory. Isn't this little elf-ette just the cutest. I love the proportions on this guy. This old sled is plaster and heavy! My BFF Beth created the snowman riding in the sled. And lastly, a Dream Pet menagerie. 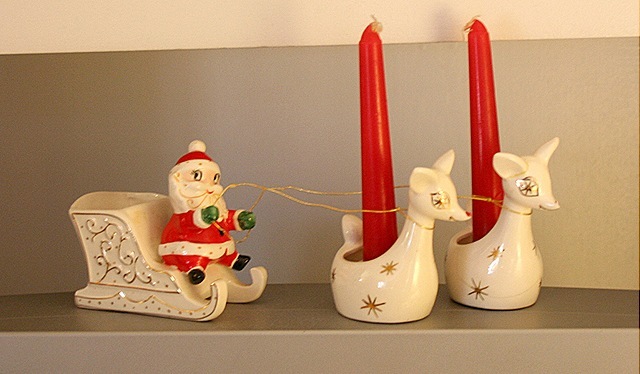 I especially like the Santas with sleighs and reindeer. 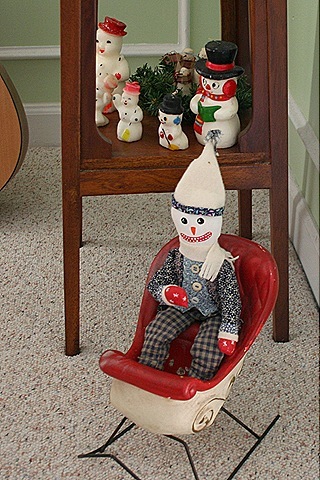 What a wonderful assortment of vintage Christmas items. 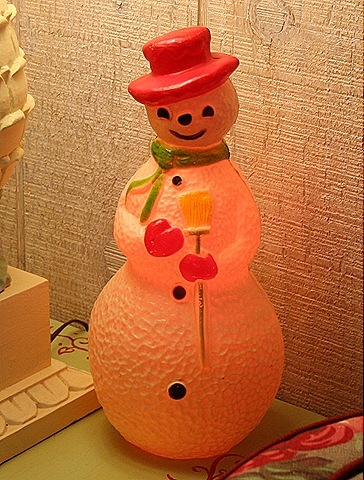 I remember light up snowmen like the one you have. Thanks for sharing all of these. Have a wonderful Christmas. I love all this kitsch glory! I think I love the look on the two reindeers with the stars the best! Thank you for participating in Vintage Christmas Monday this year. Each week’s post has been a blast! You just have the best Christmas ornies and ideas! Loved the wrapping of the art on the wall, and your collection of vintage ornaments is truthfully drool worthy. I will be working much harder in 2010 to find the best vintage goodness that I can up here in Jersey. Once again you have inspired me. Wishes for a very Merry Christmas. Oh, thanks for the closeups of those decorations I was admiring. I’m sighing, too. If you find that time machine, save a space for me! Can I go with you in the time machine? I love your little girls that say NO EL. I have two of the el girls but haven’t found the no yet!! 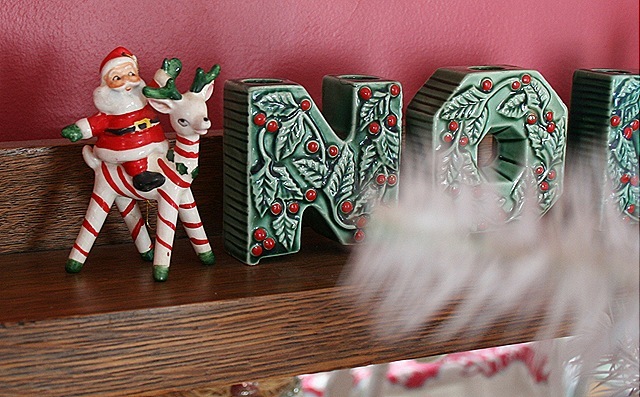 Thanks for sharing your beautiful vintage Christmas decor! You have such fun pieces!! I especially like the last one of the pets. Wishing you a very merry Christmas to you and your family. I hear ya – I’d love to be transported back into the old dime stores & old department stores (Goldblatt’s with their candy counter in the center of the store where we got a paper bag of bridge mix). Thanks again for all the vintage fun & memories! Merry Kitschy Christmas to You! 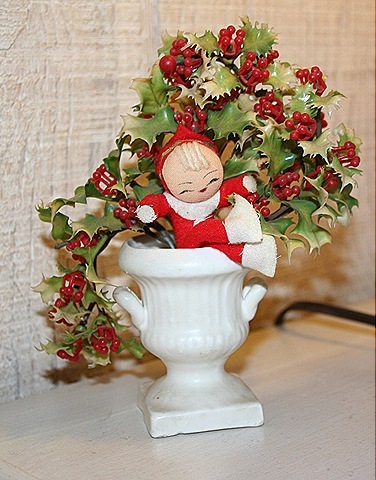 I saw a Lefton Holly Noel on ebay for the first time the other day, and YOU actually have one. You lucky gal! Suzy, I love the snowman in the sled! He’s got character. How super cute it all is! I’ve really gotten into the kitschy ornaments this year. The retro reindeer are my favorites. Oh, how I miss the Five and Dimes of my childhood. Merry Christmas. I may have told you this before, but it’s a good thing we live so far apart. If we were in the same town, I would be SO pulling your ponytail over this fabulous junk. We have so much of the same stuff! I have a sweet Christmas Dream Pet mouse I would love to send to you as a little gift…please advise! You have some really beautiful & special decorations. Happy Holidays! 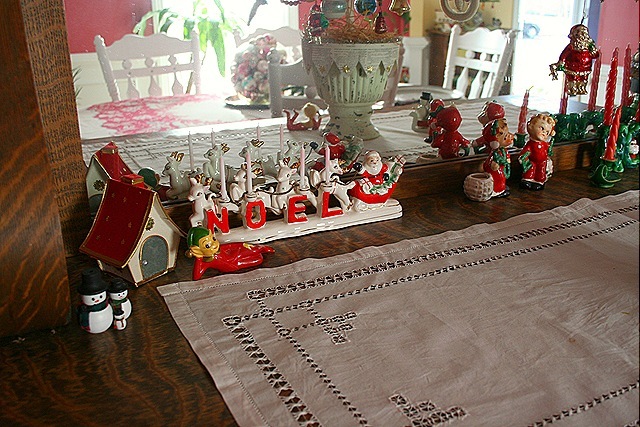 I have a few vintage Christmas collections, including a pastel winter village. I leave it out a little longer because it makes me smile so much! Okay I was going to leave a comment about your wonderfully positive New Year post, but I can’t NOT comment on all this “Kitschmas” stuff! 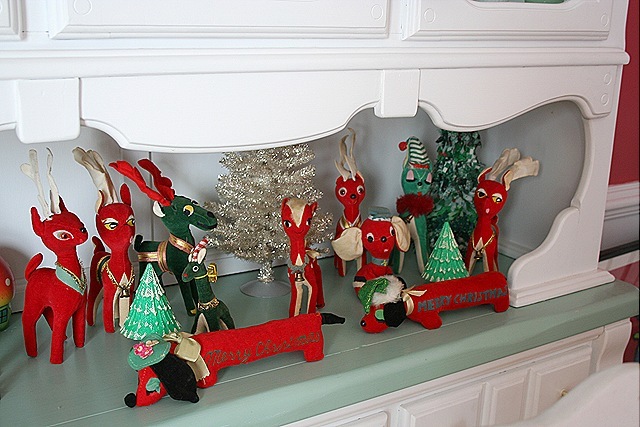 I particularly love the reindeer display but it’s hard to decide–they’re all sooooo cool. I swear girl, you could have one heck of a garage sale…and if you ever do, I’m taking a road trip! Totally agreed with you little elf-ette just the cutest. Your decoration is really darling. you are really talented and creative girl. Thanks for sharing this lovely post.